Boeing is facing mounting pressure to roll out a software update on its best-selling plane in time for airlines to use the jets during the peak summer travel season. Company engineers and test pilots are working to fix anti-stall technology on the Boeing 737 Max that is suspected to have played a role in two deadly crashes in the last six months. The Wall Street Journal reported Friday that investigators have determined that the flight-control system on an Ethiopian Airlines jet automatically activated before the aircraft plunged into the ground on March 10. The preliminary conclusion was based on information from the aircraft's data and voice recorders and indicates a link between that accident and an earlier Lion Air crash in Indonesia, the newspaper said. Boeing and the Federal Aviation Administration declined to comment on the report. Also on Friday, The New York Times reported that the Ethiopian jet's data recorder yielded evidence that a sensor incorrectly triggered the anti-stall system, called the Maneuvering Characteristics Augmentation System, or MCAS. Once activated, the MCAS forced the plane into a dive and ultimately a crash that killed everyone on board, the newspaper said. The Max remains grounded worldwide and airlines are losing money by canceling flights. Southwest, the largest operator of the Max with 34 of them and another 249 on order, said this week that the grounding caused it to cancel 2,800 flights so far, or 30 percent of all cancellations in the first quarter. It said canceled flights, including those not related to the Max, will cost it $150 million in revenue for the quarter and cut its planned capacity growth for the entire year. German tour operator TUI Group said 2019 profit will drop about 200 million euros ($225 million) because of the Max grounding. That forecast assumes the planes are flying again no later than mid-July. United Airlines, which has 14 Max jets, said the grounding isn't hurting the airline yet, but the financial pain "is expected to increase if the grounding extends into the peak summer travel season." Boeing is also seeing its own expenses rise, although it would not disclose how much it is costing the company to make the software fix and also train pilots how to use it. Cowen Research analysts say a "very rough guess" is that Boeing will pay about $2 billion after insurance to fix the plane, pay crash victims' families and compensate airlines that had to cancel flights. Most Wall Street analysts are betting that the planes will be flying again in less than three months, while noting that it could take longer in countries that plan to conduct their own reviews of Boeing's upgrade instead of taking the word of the U.S. regulator, the Federal Aviation Administration. Boeing has stopped Max deliveries during the grounding, which cuts into cash flow — Boeing gets most of its money for a plane upon delivery. Outside estimates of the cash-flow drain range from $640 million to $1.8 billion a month, but Boeing will get that money eventually unless airlines cancel orders. It is difficult and unusual for airlines to switch an order from one aircraft manufacturer to another. Boeing and European rival Airbus form a duopoly that dominates commercial airplane sales. Airlines that considering switching from the Max to the comparable Airbus model, called the neo for new engine option, would fall to the back of a yearslong backlog line. "We believe a wholesale cancellation is unlikely if for no other reason than the inability of Airbus to deal with the influx," says Hunter Keay, an aviation analyst with Wolfe Research, but he adds there is "some risk" of additional cancellations, with the big Chinese market being the most serious. If cancellations are limited to Lion Air and Ethiopian Airlines — the two carriers involved in the crashes — and Garuda Indonesia, which has announced plans to do so, they account for only about 300 orders. Boeing has about 4,600 unfilled Max orders, making up the bulk of a huge backlog that the company values at $490 billion. 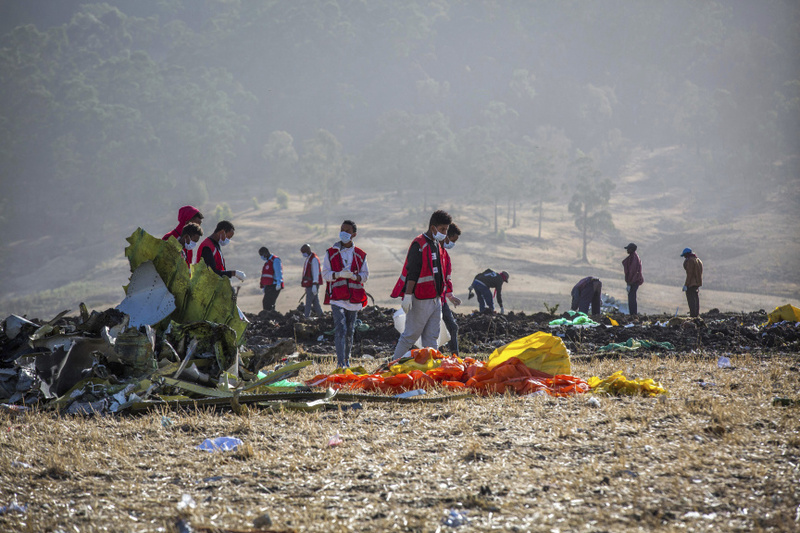 Then there is the potential cost of lawsuits stemming from October's crash of a Lion Air Max 8 in Indonesia and the March 10 crash of an Ethiopian Airlines Max 8 near Addis Ababa. In all, 346 people died. Already one law firm alone has filed seven lawsuits against Boeing in federal district court in Chicago; six were filed on behalf of families of passengers on the Lion Air jet and one by the family of an Ethiopian Airlines passenger. The lawsuits claim that the flight-control system on the plane was defective and that Boeing failed to warn airlines about it or train pilots how to respond if it caused the plane's nose to sink. The automated MCAS system was not on previous 737s. The tragedy-filled introduction of the Max is reminiscent of troubled early histories of other planes. In 1979, for instance, the FAA grounded the McDonnell Douglas DC-10 following accidents involving a poorly designed cargo door that could spring open during flight and a crash in Chicago — still the deadliest aviation accident in U.S. history with 273 lives lost — that ultimately was blamed on poor maintenance practices by American Airlines. After changes approved by safety regulators, the three-engine DC-10 returned to the skies and sold several hundred more copies before production was stopped. The plane couldn't compete with more efficient twin-engine models. Boeing's 787 "Dreamliner" was grounded by overheating batteries in 2013, but after Boeing fixed the problem it became a favorite among airlines and passengers. The same course could play out for the Max, which entered service just two years ago — as long as there are no fresh accidents to stir passengers' fears. "The public has an amazingly short memory," said Robert Mann, a former American Airlines and TWA executive. "Most of them don't even realize the kind of airplane they are flying on."